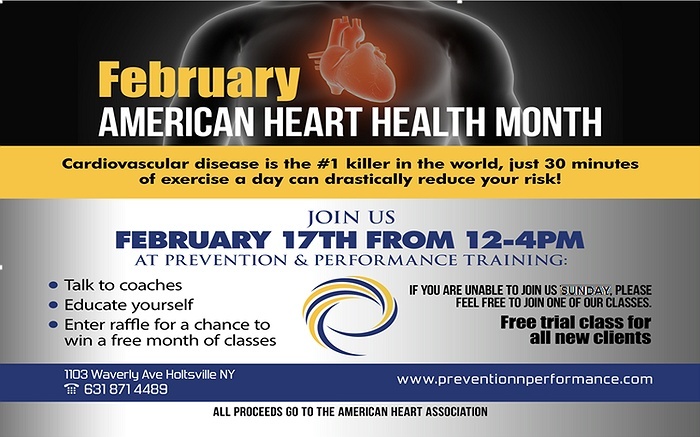 Subject: LongIsland.com - Your Name sent you Event details of "Prevention & Performance Training Meet and Greet"
Did you know February is heart health awareness month!!? Did you know cardiovascular disease is the number one killer and just 30 minutes a day of exercise can significantly reduce your risk??! Prevention & Performance Training is family owned and operated studio located right off the LIE in Holtsville. We will be hosting a meet and greet at our studio where you get to talk to the coaches, educate yourself on health and fitness, try some healthy snacks, and enter a raffle to get a free month of classes. Come learn what makes us different from the rest and how we can help you.